Option 1 ¦ Steel body + steel contoured tapered (CT) helix and steel blade. Option 2 ¦ Steel body + Titanium (Ti) coated CT helix and Ti coated blade. Option 3 ¦ Ti coated body + Ti coated helix + Ti coated blade. Special order combinations also available. Ti coated CT helix, Ti coated blade. Option 2 ¦ ‘Light’ – Aluminium body, standard steel helix, steel blade. Unsurpassed engineering, manufactured one by one in Australia with many hand worked elements. 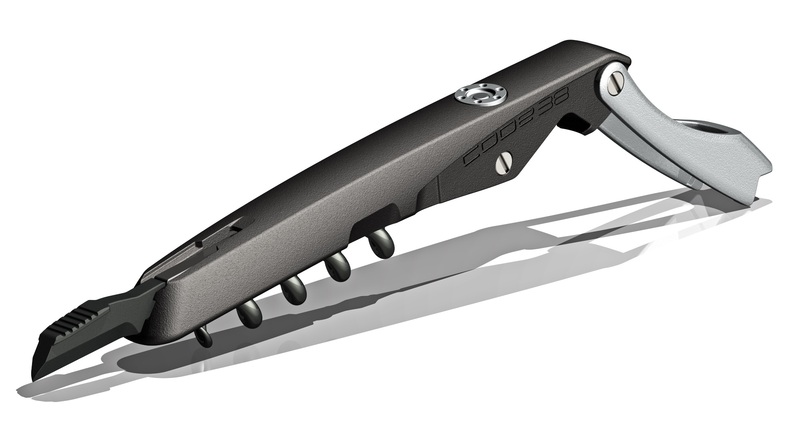 Designed and produced by an experienced industrial engineer, a Code38 always pulls the cork vertically in 1 swift smooth movement. Almost all other corkscrews lever the cork in an arc, effectively pulling the cork sideways thus increasing the risk of non-extraction or breakage (of the cork). A 2-step corkscrew is not needed if the cork is removed in 1 movement. The Elite body is formed from a hardenedsteel alloy called 14-7PH : typical weight (inc knife/helix) 70g. The P-Type PRO body is milled from 304 Stainless : typical weight (inc knife/helix) 110g. The P-Type Light body is milled from Aluminium : typical weight (inc knife/helix) 60g. Titanium elements are always an aesthetic coat over steel. The knife can be opened with 1 hand, it can be replaced and or repeatedly sharpened. The Elite knife is fixed in a straight line and the P-Type knife is on a hinge. The helix is tapered to decrease the impact on the cork and is replaceable if excessive for causes it to break. The quality, durability, leverage, force and reliability are unique Just as there is something special about a Zalto glass, there is also something special about a Code38 corkscrew. Both have to be held and used to truly appreciate the form and function. As perfect to use as it is to look at.